Welcome to an urban history of San Diego's Balboa Park. My name is Jonathan Bechtol and this website is part of my thesis, analyzing how Balboa Park has transformed as part of San Diego's urban landscape. My thesis combines a traditional paper with a digital project. I chose to create a website as my digital project because it offers a great opportunity to explain my argument through visual sources and helps the visitor sift through years of varying uses. 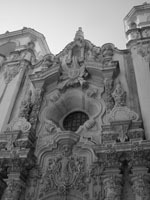 The links on the left will take you to web pages that examine the history of Balboa Park during certain years. The Visual Essay web page helps the visitor understand how the use and physical changes occurred from the late 1800s to the 1980s. The Links and Works Cited pages give the visitor further information on the history of Balboa Park and issues pertaining to urban space in general. For questions and comments, please email me at becht004@cougars.csusm.edu. By clicking the pictures on the right give the visitor a visual sneak preview of the many uses and architecture of Balboa Park. Most photos can also be clicked again for a more detailed view. Check out my flickr account with various photos of Balboa Park, click here. Become a fan of Balboa Park on Facebook, click here. To download my thesis, click here. Although sometimes overlooked, the public park is an important facet of the urban landscape of American cities. As an urban space, parks are dually shaped by the landscape designers and by the public, each operating with specific goals and biases. Oftentimes park management and visitors disagree as to the nature of what a park should be. Some view parks as romantic, pastoral escapes from the crime, noise and pollution of the city. Others push for a multipurpose space, inclusive of the needs of the majority of the public. What makes each park unique is how these issues and debates reflect the local and national issues of the day. Urban scholar Hilary Taylor writes, "As one of the most powerful arenas of cultural debate, mediating between the public and private world, the designed landscape is essentially a manifestation of personal and historical ideology." She continues to write that the public park "is a site - both physical and philosophical - of political, cultural, social and economic debates." (Hilary Taylor, 201) How and why the park was designed, who uses it, and how it is remembered, play into the park's cultural identity. Diverse groups, each with their own specific concerns and issues, shape these various facets. This website will explore the various stages of Balboa Park's development and examine how the differing needs of San Diegans transformed its use from the site of a world's fair to its current application as the city's cultural center. City Park, as it was known, was created in the late 1860s as a public space for the people of San Diego to use. It was home to a dog pound, orphanage, ammunition dump, school, and many other things prior to the turn of the twentieth century. In the early 1900s, San Diegan city elites sought to host a world's fair in honor of the completion of the Panama Canal. 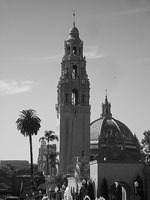 The city was successful in its attempt and changed the name of the park to reflect a mythic Spanish history that predominated the region to Balboa Park. The Panama-California Exposition was held in 1915 and was so successful that the city opted to continue it for another year. When World War I broke out, Balboa Park was handed over to the navy. There, in what used to be lily ponds, sailors learned to row boats and many of the old exposition's buildings were used as barracks. Once the war was over, the city regained control of the park. Civic leaders of San Diego decided to keep the exposition buildings, using them for cultural organizations and simply enjoying the beauty of its architecture. Many of the original 1915 buildings remained when San Diego again decided to host an international exposition in 1935. Much of the Spanish aura that dominated the first exposition was gone. Like many world's fairs of the time, the themes of progress and beauty replaced it. The 1935 California Pacific Exposition was another successful attempt of hosting a world's fair by San Diego and ran for two years. Like the first exposition, the citizens decided to keep many of the buildings. Visitors were not able to enjoy the newest additions to Balboa Park for long, as World War II forced the park back into military service. It acted as an extension of the Naval Hospital and had many uses. Some buildings were used as infirmaries, others as barracks, and as a training center. After the war, civilian use was reinstated and the park experienced a benign neglect that lasted throughout the 1950s. In the early 1960s, concern over the dilapidation of the buildings was raised and there were attempts to save as many as possible from the wrecking ball. The problem then became who had the final say over the future of the park and where the money would come from. Private organizations coalesced over these issues, some wanting to preserve the park while others sought to return it to a natural setting. By the 1970s and 1980s, issues over preservation versus nature were compounded. New groups, including the gay community and the Centro Cultural de la Raza, sought to establish themselves alongside established organizations like the Museum of Art for example. They did so by forcing their way and establishing themselves either through festivals or cultural organizations, the outcome being a diversified and democratic park. As the one-hundredth anniversary of the 1915 Panama-California Exposition nears, many of these issues are as prevalent as they were forty years ago. San Diegans still debate them and seek ways to manipulate this urban space to their liking. There are no easy answers with a democratic space like an urban park, and only through negotiation and accommodation of one's opinion can Balboa Park survive the twenty-first century.